I was reading Eryn Bates’s blog yesterday and it was all about the culture of gratitude in our organization. I totally agree with her, but as a joke said that I was gonna try to write the most unthankful blog I could think of today. And while that is not going to happen (a. because I tend to be a thankful person and b. there is much to be thankful about) I will try to perhaps write a blog that doesn’t just focus on the thankfulness I feel everyday about getting to work as a professional theatre artist for the greater part of the last two decades. I suppose I have already failed at that since that last sentence sounds pretty grateful…but I will try as I move forward. I am doing lots of varied things in the office these days. Reading submissions for our New Works Festival, reading potential plays for next season, writing the script for our upcoming season announcement, asking for auction items for our upcoming Gala, you know, working in the office of a professional theatre. But one of the things I am always doing is trying to keep an eye on books, articles, and websites that talk about the artistic side of what we do. And I don’t mean How-To books on acting or directing. I mean critical thinking about the business and art of running a non-profit theatre. This is a relatively young movement, the non-profit theatre. However, the books I am interested in span over half-a-century. I have been looking at a collection of essays by founders of theatres across the country and stumbled upon one that mentioned an article written in The New York Times by Brooks Atkinson called “Ought We To Found A National Theatre?” For various reasons, none of which are necessarily germane to this blog, I thought I would track it down and see what it had to say. 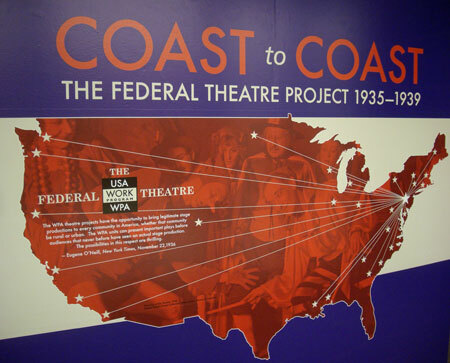 The article was originally published in 1940, and had to do with the then recently defunded Federal Theatre and the debate on whether to establish a National Theatre, one that was not driven by commercial success in New York City, and was available at affordable prices to as many people across the country as possible. There are two things that strike me as interesting about this article. One is how much has changed since it was written. The other is that things haven’t changed that much. What has changed in the 74 years since this article was published is that the regional theatre movement has taken root in this country, somewhat supplanting the need for a National Theatre (though this is still debated among theatre makers). Not many years after its publication, a few brave and tenacious theatre makers took some of the ideas expressed in this article and decided to produce professional theatre outside of New York. These few theatres grew into a few more and now there are professional theatres all over the country. I am proud (is there implicit gratitude in pride?) to be a part of that movement. There are things, however, that haven’t changed. We in the theatre still compare ourselves to our European counterparts (and generally that comparison favors them and not us), we still struggle with funding our endeavors, and have spirited debates about the role that government should have in that funding, we struggle with keeping our ticket prices low enough to be a truly democratic movement, something that is available to all members of a community, we are still striving to not have New York City commercial theatre be the center of the theatrical universe, and we are still in need of fostering new voices in playwriting that reflect the diversity of the American experience.